Chef Lenger practices what he preaches, and has done a lot of studying on his path to chefdom, both in the classroom and in real kitchens. His mentor, who taught him the culinary aspect of the business, was Ewald Plachutta, who he interned under for over three years in Vienna. It was his father, however, who guided him through the whole process, and who he most admires. A retired culinary teacher who opened several restaurants, he tried to convince his son not to pursue a chef's career, but the young Lenger had so much love for it. When he told his father he wanted to go into this business, he said, "You have to be consistent, on the ball every day." He helped him through the process of becoming a chef and got him great places for his internships, yet he was very hard on him. He used to say, "If you want to be successful you have to be better than everyone else." Says Chef Lenger, "I thank him for every day he was hard on me." His father taught him well. Chef Lenger believes that what has to happen every day to ensure success is consistency. "Inconsistency will show in every aspect of the restaurant," he says. "If the food is inconsistent, the customers realize it. If the service is inconsistent, the customers realize it. The biggest success comes from being consistent, doing what we do on a daily basis. The service has to be consistent on a high level, and the kitchen has to be consistent on that same high level on a daily basis. It doesn't matter whether you have an hour's sleep or 10 hours' sleep; the food must be consistent. Every day the service and food must be at that same high level." Chef Lenger attributes his personal success to his determination, and of course, his dad. Both have helped him on his way to Vegas, and to The Country Club, in particular, where he loves everything about the restaurant. 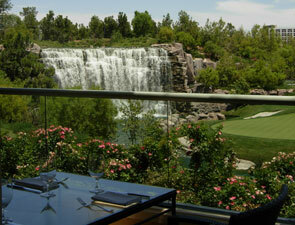 Outside the kitchen, his favorite thing about The Country Club is that his restaurant overlooks the waterfall and the 18-hole golf course. "It sets you a little bit away from the strip, while being on the strip," he says, "which is one of the greatest aspects of The Country Club." His favorite thing about the kitchen, meanwhile, is the great food, coupled with the great atmosphere and great service. "There's even great service at the bar," he points out, which everyone knows can be a little tricky!